Last month, T-Mobile closed its acquisition of Layer3 TV, which had been announced back in December. We got the details on how Layer3’s team would join T-Mobile and a tease for T-Mo’s upcoming TV service, but one part of the deal has eluded us: how much T-Mobile paid for Layer3. Now that info has been revealed. T-Mobile paid around $325 million for Layer3 TV. That’s according to an SEC document that T-Mobile filed today as part of its Q4 2017 earnings release. T-Mobile plans to launch its pay TV service in 2018. It’ll combine traditional cable TV channels with online video in a single interface, but little else is known about what it’ll be like to use or how much it’ll cost. T-Mo has said that nearly 200 Layer3 TV employees are joining T-Mobile as part of this acquisition and that Layer3 CEO Jeff Binder will join T-Mo as an Executive Vice President and member of the Senior Leadership Team, in addition to leading the TV team. Who cares? This basically is a software aggregate platform, and a 2 city offered pay-tv system that hasn’t caught on, hasn’t been proven to gain subscribers, and seems like it will end up being just another revamped T-MobileTV app at the end of the day. It is something that will be offered to T-Mobile ONE customers, but not to loyal “got TMo where it is today” Simple Choice users anyway. To be honest, that’s 325 Million they could have used to fix the network in the Bay Area which is now falling fast to 4th place behind Sprint. T-Mobile needs some kind of content. AT&T has U-verse, Directv, Directv Now, HBO, and etc. Verizon has Fios and is launching their own Streaming service. T-Mobile had nothing. Sling TV, Directv Now, PS Vue, and Hulu Live is in business for a reason. What content does Layer3 own? Seems to me none of you have any idea how its going to work since the service has not been announced. Perhaps you should see what is actually going to happen instead of pre-judging. T-Mobile has already indicated they will not be packaging services like AT&T does so you can stuff that right away. 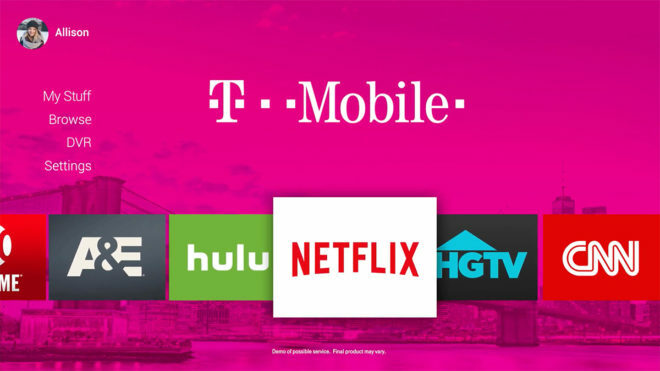 It’s a good move by T-Mobile, and if history is any indicator, it will be priced very competitively when compared to OTT offerings from Sling, DirecTV Now, and YouTube. I am looking forward to this latest disruption although I think only T-Mobile subs will take be able to take advantage. As a MetroPCS customer, I know I will be left out. I still feel TMobile should have purchased Zayo for their Nationwide fiber network, which would help lower the costs for a 5G network, and/or Dish Network for their spectrum. I think a Dish combo would be the best, but who knows. We’ll see how this L3 offering turns out in the coming months. I think its more about changing the way TV is bought and delivered. Dish would have placed T-Mobile in a standard TV delivery market. Although Dish has sling, they wouldn’t be able to ignore the giant Dish delivery network already in place which would force them toward more of a legacy TV model.